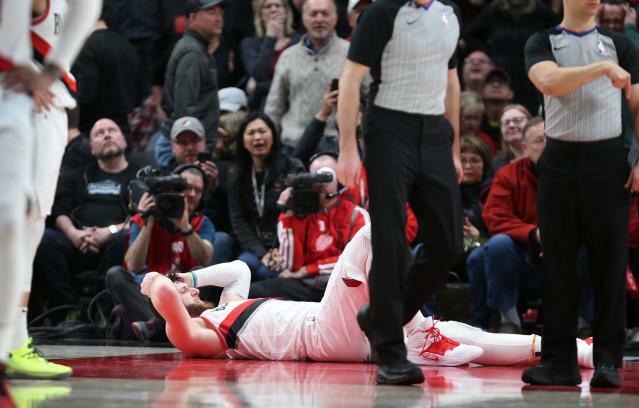 Portland Trail Blazers center Jusuf Nurkic went down with a gruesome, season-ending leg injury on Monday night in the second overtime of their matchup against the Brooklyn Nets at the Moda Center, and had to be stretchered off the floor. With the Trail Blazers up two points and less than three minutes to go in the second overtime, Nurkic went to grab a rebound after a Maurice Harkless miss. Nurkic caught the ball and attempted to tip it back into the hoop. He missed the shot, and as he came down, his left leg snapped and collapsed as he fell to the floor. WARNING: This video is graphic. Play was instantly stopped and a towel was quickly placed over his leg, covering it from view while he lay in pain for several minutes. Nurkic’s leg was then placed in an air cast before he was stretchered off the floor. Portland center Jusuf Nurkic suffered a compound fracture to his left leg and will require surgery, costing him the remainder of the season. Nurkic left the game with a season-high 32 points and 16 rebounds, having shot 13 of 24 from the field. The Blazers held on to beat the Nets 148-144 in the second overtime. Terry Stotts calls Jusuf Nurkic injury “devastating.” The Blazers held a moment of silence and said a collective prayer in the locker room after the game. Nurkic has been taken to a Portland-area hospital. Nurkic led the Blazers with his 32 points, followed closely by Damian Lillard, who finished with 31 points and 12 assists. Seth Curry added 20 points off the bench, and Rodney Hood finished with 18 points. D’Angelo Russell led all scorers with 39 points for the Nets, shooting 16-of-34 from the field. Spencer Dinwiddie finished with 22 points off the bench, and DeMarre Carroll added 18 points. “It made me sick to my stomach,” Lillard said, via Joe Freeman of The Oregonian. “I was playing at the game in Vegas when a similar thing happened to Paul George. That’s exactly what it looked like to me when I saw it. Almost instantly, players from around the league took to social media to wish Nurkic well after the horrific injury. Prayers up to Nurkic 🙏🏾 Hate to see stuff like that.